Degeneration of the deep anterior oblique ligaments (beak ligament) leads to the development of osteoarthritis of the TM joint. Natural history: severe thumb pain may gradually improve as the disease worsens and thumb CMC motion decreases. 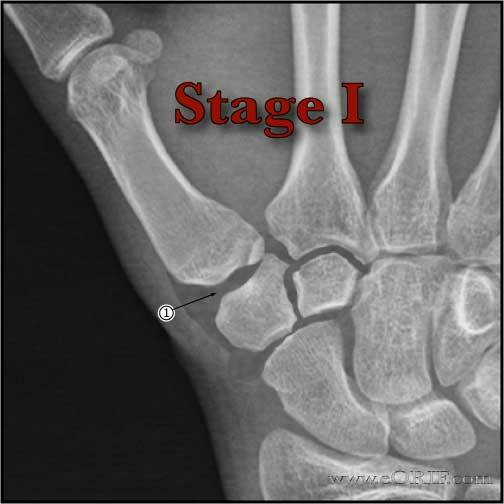 Major stabilizers of the trapeziometacarpal joint = anterior oblique (beak) ligament, dorsal radial ligament. Tenderness along the thumb trapeziometacarpal joint. Pain and weakenss with pinch and gripping activities. 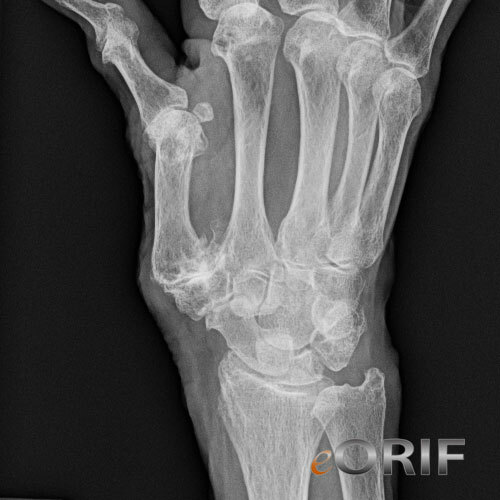 Decreased radial and palmar thumb abduction. Grind Test: axial compression, flexion, extension and circumduction reproduces patients symptoms. Evaluate for MCP hyperextensibility. MCP hyperextension greater the 20° may compromise LRTI outcomes. Consider fusion. Allen's test indicated to determine patency of ulnar artery if surgery involving the radial artery is considered. Posteroanterior (PA) 30° oblique stress view , a lateral view, and a Robert's (pronated anteroposterior [AP]) view. 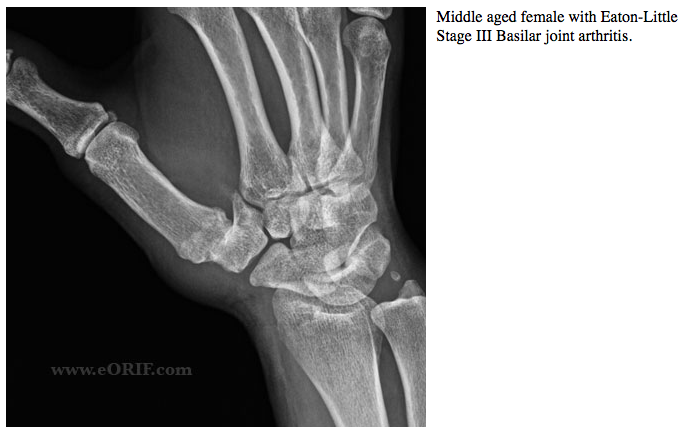 Eaton Littler Staging of Basalar joint arthritis (Eaton RG, J Hand Surg 1984;9A:692). Initial treatment = NSAIDs, corticosteriod injection, splinting, activity modifications. Stage II (Joint space narrowing with debris and osteophytes less than 2 mm in size.) = LRTI, or trapeziometacarpal fusion or implant arthroplasty. 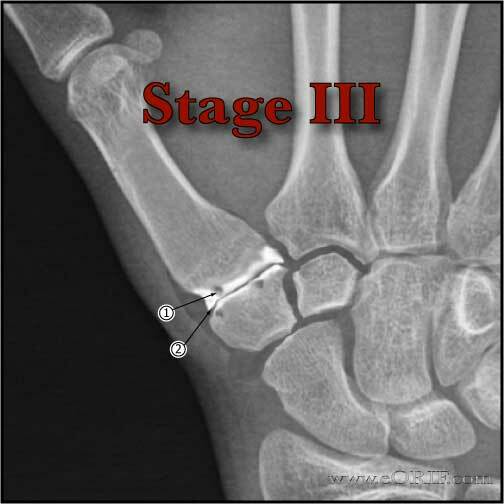 Stage III (Joint space narrowing with debris and osteophytes greater than 2 mm in size) Treatment = LRTI, or trapeziometacarpal fusion or implant arthroplasty. Stage IV (Scaphotrapezoidal joint space involvement in addition to narrowing of the trapeziometacarpal joint) Treatment = LRTIwith complete trapezium excision. Continued pain. (generally from unaddressed scaphotrapezial or scaphotrapezoidal disease). Numbness (sensory branch of Radial nerve injury). 4 Weeks: remove k-wires. Removable thumb spica splint, with gentle assisted range-of-motion (AROM) exercises. 6 Weeks: Wean out of splint. Begin strengthening exercises. 3 Months: assess outcomes, Xrays to assess arthroplasty space height. 1Yr: assess outcomes. Functional improvement can occur up to 1 year postoperatively. Burton RI. Ligament Reconstruction Tendon Interposition Arthroplasty. In: Lane LB, ed. 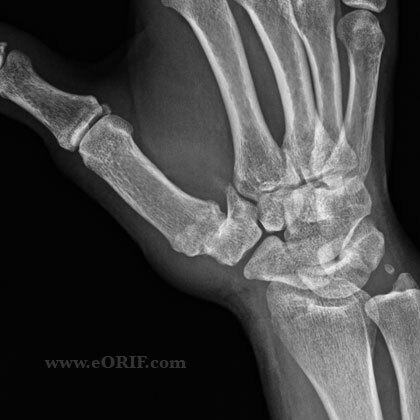 Atlas of the Hand Clinics: Carpometacarpal Joint. Philadelphia: WB Saunders, 1997:77.